There are cookbooks and websites that seem to be inspired mostly by foods one might hypothetically desire after consuming a smokable plant now decriminalized in dozens of states. Then there’s the Smitten Kitchen, where recipes are mostly motivated by irrational cravings or failures of self-control. Days like this, I’m pretty sure our disparate paths have led us to the same place. By now, you might be familiar with matzo crack, which is what happens when you raise the aptly-named “bread of affliction” to what has got to be its most hardship-free calling: butter, brown sugar, sea salt, dark chocolate and toasted nuts. In the Passover off-season, i.e. most of the time, I think it’s even better with saltine crackers. Baked, cooled, and broken into chunks, it’s crunchy, buttery and caramelized and I cannot be in the same room with it without debasing myself, so I sometimes hide it from myself in the freezer. This has led to a conclusion you might have predicted — that it tastes rather excellent frozen. If this tale sounds familiar it’s because I confessed about the same last year — that years of hiding brownies from ourselves in the freezer had basically turned us into people who preferred them chewy, fudgy and extra cold. And so I embraced it with two thin sheets of brownies enlisted as bookends to a perfect ice cream sandwich. Having not learned my lesson, this year I’m doing it with my other favorite freezer stash. I mean, not that anyone would be into this kind of thing. Sheets of salted cracker toffee slathered with dark chocolate and studded with toasted nuts used to sandwich vanilla ice cream? Right, only a monster could love such a thing. Or worse, a very pregnant monster, a 5.5 year old, and a husband that loves chocolate and ice cream above all else. Wow, I just realized that there’s not a single person left in my household that might try to reason with me these days, to talk me and my calorically decadent recipe whims down from a ledge. Then again, I guess you could say I’ve done something right after all. Heat your oven: To 350°F (175°C). Prepare pans: Line the bottom and sides of 1 9×13-inch baking sheet or 2 8×8-inch cake pans with foil, then lightly coat foil with nonstick spray. Arrange crackers in a single layer so that they fit in the bottom of your pan. In a perfect world, you wouldn’t have to cut any to make them fit flat. In ours, I used a serrated knife to cut several to fit neatly. Having no crackers overlap will make it easier to spread the caramel in a few minutes. 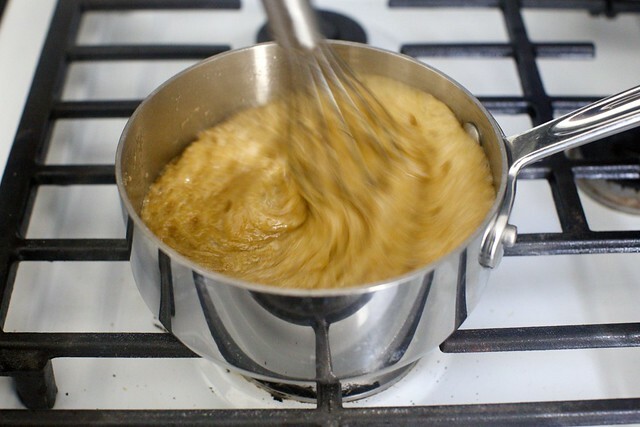 Make toffee: In a medium-sized saucepan over medium heat, melt butter and brown sugar together. Stir until it begins to boil, then whisk (which will help the butter and sugar come together) for 2 to 3 more minutes. Remove from heat and stir in vanilla. I only add salt at this point if using unsalted crackers, i.e. not saltines. 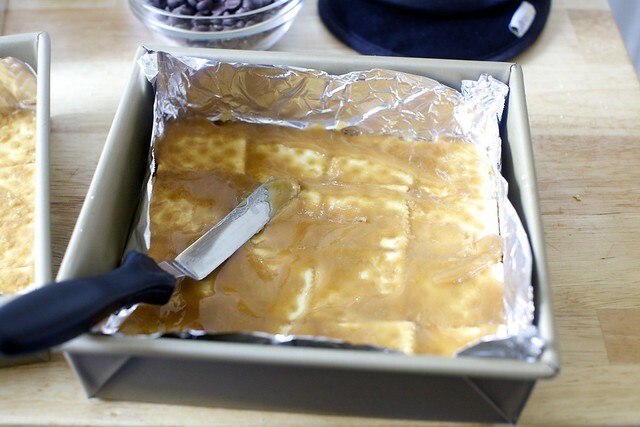 Pour over cracker-lined pan(s) and use an offset spatula to evenly spread the caramel, working quickly as it will be eager to cool and set. Bake: In heated oven for 10 to 15 minutes, checking in at 10 minutes to make sure the corners aren’t darkening too quickly. 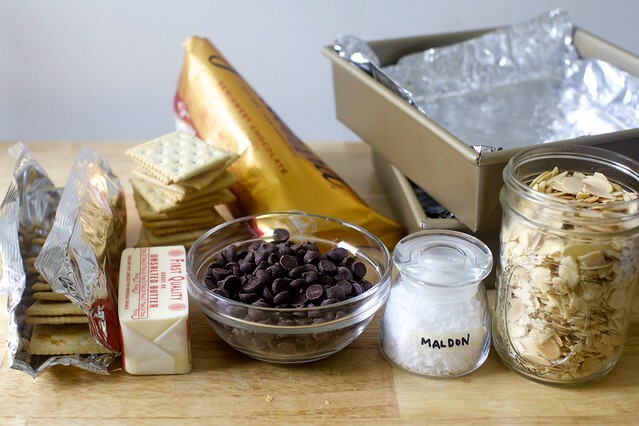 Remove from oven and scatter chocolate chips over caramel crackers. 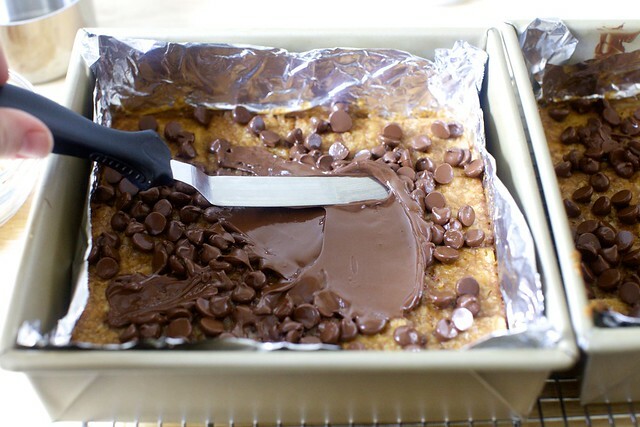 Wait 5 minutes for them to soften, then use a spatula to spread the chocolate into an even layer. Sprinkle with nuts and a couple pinches of sea salt. 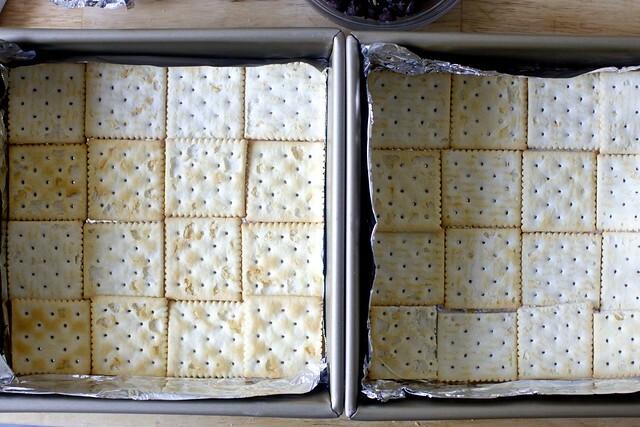 Chill crackers: Transfer pan(s) to freezer until absolutely cold and solid, about 15 to 30 minutes. Using the foil to lift toffee sheet, carefully transfer the candy to a cutting board and remove the foil. If you’ve made this in one pan, cut your sheet evenly in half with a serrated knife. Assemble ice cream sandwich block: Line the bottoms and sides of your baking pan (now foil-free) with a piece of plastic wrap. Place your first sheet of candy chocolate side down in the bottom of your pan. 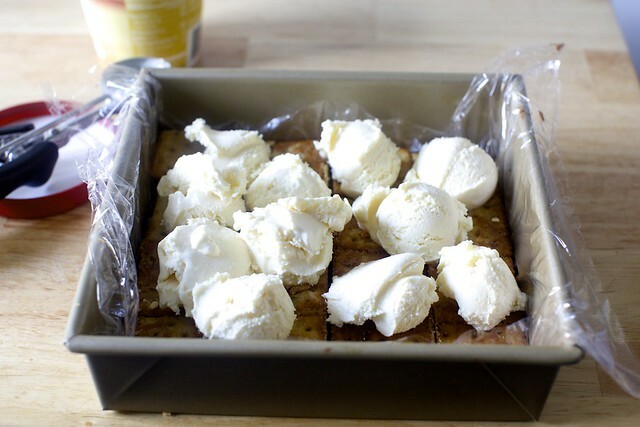 Scoop your desired amount of ice cream over the sheet and spread it into an even layer. Place second sheet of candy, chocolate side up, on top, pressing it onto the ice cream. Return to freezer for several hours, at least 4 but probably 8 is best to get the block of sandwiches solid enough to cut without being completely aggravating. Cut block into individual sandwiches: When sandwich block is frozen solid, transfer to a cutting board (you can also freeze your cutting surface for 10 minutes before using, to give you more time before things get too melty) and use a sharp serrated knife to very, very carefully saw your block into ice cream sandwich squares. I cut my 8×8-inch blocks into 16 2-inch sandwiches. This is definitely the peskiest part. If things warm and melt too fast, just place the whole thing back in the freezer for 10 minutes before continuing. Once cut, return sandwiches to freezer to let them firm up again, before transferring them to a container or freezer bag for store, or, you know, your mouth for near-immediate gratification. Ummm…I think I just died. You’ve done it again, Deb. YOU are an evil genius. I usually make this around Xmas, w/crushed starlite peppermints rather than nuts, but you just gave this year-round charm. This is the perfect example of what makes your recipes great. As soon as I see it, I know it will be delicious, and it looks so obvious I can’t believe I didn’t think of it myself. have you had the salted crack caramel ice cream from the Ample Hills Creamery? It reminds me of this and also something you would probably really love! Oh, YUM! Saltine toffee is my favorite way to eat toffee. It’s just enough toffee made tender by how thinly it coats the crackers and the salt just elevates the whole flavor. Adding ice cream, I imagine, just helps keep it crisp to the end. Can’t wait to make these. you’re right, it may not be the most high-brow, but it still gets all the textures and flavors that i want. sounds perfect for summer. This might be your greatest post yet — purely for the light-hearted self-condescension and opening paragraph. Love love love. Oh, holy hell. I no longer like you. Just kidding; we can be bffs. I’m Jewish, I know all about the matzo crack. This looks so much better. I almost drooled. Did you notice that around this time over the past six years, you have posted about a dessert? :) Must be something inspirational about the beginning of summer! Woah woah woah! This is the most beautiful thing I have ever seen. yes, yes, yesssssss!!! all over this! so delicious! yes. saltine crackers are under appreciated in desserts! Making room in the freezer immediately! You’re making me cry… I’m at work and can’t do anything about the new craving you just created in me! I just find it so refreshing how accessible the ingredients for your recipes are. Most often than not I already have everything I need to make them. And this is coming from someone in the middle of the Mediterranean who finds it hard sometimes to source things. That’s why I look forward to your every post. Thank you! Salty sweet carmel is my favorite – these look amazing and will make my ice cream sandwich loving kids so happy. I love seeing something so different like this! Might have to share the love on my blog! I think Jennie B said it best. Just wow! Now I know what I’m making this weekend…and eating! What a great idea! We’ve been enjoying the saltine crack since you first posted about it six years ago. I can’t wait to throw some ice cream into the mix. Perfect, thank you! Gods bless pregnant recipe developers! During Passover, I used my leftover matzoh crack to make s’mores. I had homemade marshmallows from my homemade Peep project, and torched the s’mores with my creme brulee torch. the s’mores were UNREAL. Like, truly one of the best things that I’ve ever eaten. My 8 year old wanted to know why we had to wait until next Passover to make them again! Why not put the chocolate side of the bottom layer on the inside to make it easier to eat? Uh yeah, now you’re talkin. Have you tried the graham cracker version? There’s nothing bad about them either. The nuts need something to stick to, I imagine. These look fantastic! I just wondered how long they’ll last in a container in the freezer (assuming you can resist eating them all immediately). They seem like they’d be good as a do-ahead dessert for a party. Thanks for your help! Yum. When we were little, Mom would mix up plain frosting and slather it on saltine crackers for us. Very low brow and very delicious. 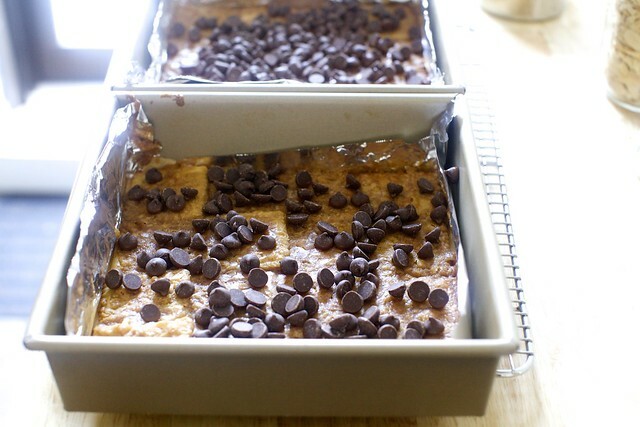 These sound delicious, thank you for sharing the recipe! What a simple and delicious treat. I have to try this one. My kids will love it. I also cook for clients and the non-paleo clients on my list will also love this. Nothing like a great comfort food summer treat. I love Smitten Kitchen! Thanks for filling my FB feed with yummy recipies. Your website is always my first source for a recipe. Oh my god! I am simultaneously ecstatic and cringing. Ecstatic because this sounds soooo delicious and cringing over the amount of running I’ll have to add to my week to work this off. I’m going to guess it’s worth the extra running and that I’ll be making these this weekend. Once again, Deb, you are my hero! Oh my goodness. I don’t even know what to think about this, except that they must be made. Right now. And I don’t have any of the things required, except the chocolate chips. You know there are certain things I only make once a year. And I totally justify eating them because they are only once a year….you’ve now ruined that for me. This Christmas staple will now need to also be made in the summer. With homemade ice cream. And eaten way too many times. You’ve both made and ruined my day….thank you! this is the first food blog i started following and ITS THE BEST! i have come across so many websites and blogs but i must say whatever comes out of smitten kitchen is always the best. love your desserts especiallY! This may be one of the most sinful things you’ve ever posted. Will have to make immediately. Summer in a square. Was almost thinking these could never be better…but then I saw the post by #26…dang! ANY beige ice cream is my favorite. When first wed- Hubby would ask what flavor I wanted and my reply was always “basic beige” he never went wrong, (in ice cream at least…)! Thanks to Scargosun my summer is MADE! You rock Deb. I just realized that we’re ordering pizza tonight, I have fresh cream in the fridge, and homemade ice cream from the Cuisinart would be the perfect consistency. A totally legit Friday afternoon activity with sweet rewards. Thank you! I admire your strength in being able to get those sandwiches back into the freezer to harden. My batch will be missing one or five. You have to be kidding with these. OMG. Well Girl, you’ve done it this time, (and I’m so glad you did)! It never occurred to me that the Saltine Crack Toffee Chocolate could get anymore decadent. Sharing this with all my girlfriends right now! Brilliant. I’ve made the crack a thousand times but never thought about putting ice cream between two pieces. Wow, these look amazing! I love homemade ice cream sandwiches, but sometimes they can be a little hard to eat and messy. What a the perfect solution! so, i’ve never tried your brownie ice cream sandwich recipe, though i’ve been dying too. a friend (whose beach house i frequent) though they might be too “involved” to make. well i was a fool and now i’m definitely going to this summer, and i’m sure she’ll thank me. THEN, the next weekend i’ll make these! haha! i also love that you put a summer twist on these. we make these cookies during christmas and i love that i now have an excuse to shake up the seasons! thanks, deb! The only thing that is saving me from this recipe and the imminent “wear granny pants” alert is that I live in a remote area where buying ice cream requires a military operation to get it home without drenching a cooler (or my trunk). But holy moly does this look good. I’m drooling. And what a marvelously funny post. Definitely putting these in the “just don’t go there” recipe file. 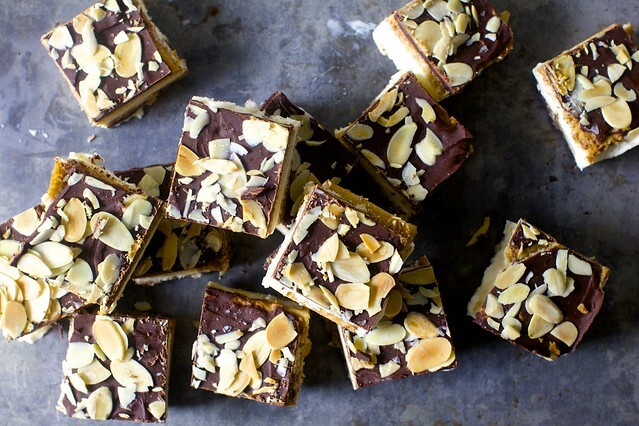 Who knew saltine crackers could be such a delicious-looking dessert!! I always appreciate validation of my baser food whims. And also, your writing is so witty and self deprecating in this post- what a pleasure to read! @33 LindaAP- the only reason I can figure is that it is essential for the chocolate to melt on your fingers so you can lick it off. Maybe Deb will explain. These really do sound yummy. I have not eaten matzoh crack, but adding ice cream sort of takes it over the top. I love the mini ice cream sandwich idea…just enough. Thanks Deb! This is such a simple but beautiful recipe! It really is a fantastic dessert for the whole family. It’s my first time knowing that you can mix crackers with ice cream. I guess creating an ice cream sandwich is a mix-and-match game. Loved you already, but writing ‘Days like this, I’m pretty sure our disparate paths have led us to the same place’ makes you one of us. Oh my gosh. This is my kinda crack. I’m 8 months POST pregnancy #2, and you’re not at all helping my quest to shed the remainder of my (20kg!) baby weight gain..! I’ve made similar recipe before, how did you prevent the crackers from floating to the caramel surface whilst baking?? That’s what happened to mine, maybe my caramel ratio was too high. Oh gurrrrl, you done did it. I was just thinking about using saltine crack as the crunchy layer in an epic ice cream cake im planning, but this.. This! This is freaking genius. Well played, sista! To repeat what was said above – Just, wow. I love a crazy over-the-top dessert mashup! And I envy the tidiness of your ice cream cookies! Also, this reminded me that my Grandma used to put crushed crackers on Chapman’s vanilla ice cream for me when I was a kid (also digestive biscuits, yum! ), so, thanks! Lara, I have Ample Hills salted crack whenever I visit my daughter in Brooklyn-she lives around the corner from them! (She is also a size 2 which boggles my mind, but that’s another story). Deb, thank you for a recipe that will let me come close to satisfying my favorite ice cream craving! Years ago, in a time before matzo crack, when I was in college (late 70s-early 80s) a friend of the family brought something to the football tailgates called Nutty Grahams. Same recipe but the base is graham crackers. Try this variation. So delicious! The combination with ice cream would also be divine. thanks so much for this! The brownie ice cream sandwiches have become a go-to (I’m going to make them with students the last week of school), and then this morning, I walk into my neighbourhood bulk store, and my favourite employee has this pulled up on the computer behind the cash, and I’m like…..”she didn’t”, and she says “oh, yeah, she did”, and we have this total fangirl freakout, and the other people in the store are laughing at us, and I realize again, that I love where I live. Thanks for that moment. My staff is already addicted to crack at Christmas, and now we can have this for the last day of school, when there are no children, and we don’t have to be nut-free! Seriously! Just tried this magnificence, results are in the freezer for however-long-it-takes-me-to-write this, then boom! Mouth-time! I melted the chips, worked fine. Don’t have an offset spatula, so thought melting would be easier. I thank you for this fine addition to our culinary heritage. There are some times you have to perform a sacrifice–saltine crack or yogurt–and this is one of those times. Crack today, yogurt all next week. Let’s live a little! Mmmm. Might try with what I have on hand today: graham crackers, green tea ice cream, pecans, extra dark chocolate and Maldon salt. Hmmm. Oh goodness! These look delicious! Must run to store . . .
summer, ice cream, chocolate, nuts, caramel crazy and those dear little leftover saltines from winter/soup bingeing. I have saved ice cream sandwich recipes over the years including yours. I have never made one. Probably the one dessert I have never made. I really don’t know why. I think, no, I know that is about to change. I am making these this weekend. My husband recently was diagnosed with celiac disease. Our kitchen is now gluten-free. WOE. I will totally be making these! I now have a serious craving! I didn’t think the crack could be more decadent… and then you did this. I want to cry tears of joy! Oh deb, whoa is me. I thought that I could limit my intake of anything mildly toffee related to the Passover season (which seemed to be very long as far as the presence of Motzah Crunch was concerned.) now you have really gotten me into trouble. I continue to enjoy your website and cookbook in spite of this. This is a well-timed post as I was just wondering what to do with the abundance of saltines one gathers in the first trimester! Husbands always overload you if you send them out to the store once for crackers and gingerale. Looks amazing, I love mixing salty and sweet! I think this is your best concoction EVER!!! Thank you for sharing. I made this for a party last night, except I did not even get to the point of assembling it with the ice cream because the guest swarmed around the slab of saltine goodness like a bunch of vultures. The entire slab was gone in minutes and beat hands down all the other, much more complicated and time consuming desserts that were on offer. I made these today and cut them in enormous squares. Boyfriend was very pleased. I like it a lot! Especially with some salt sprinkled on top. Thanks! Re spraying the foil liner….have you tried using Reynolds heavy-duty non-stick foil instead? It’s amazing….. Especially for things like roast chicken or oven-fried potatoes…nothing sticks…. Wait ’til you try toffee poured over plain tortilla chips…good gracious! Beyond! You are a genius! I am definitely making this. By the way you have made my husband into a person who eats seconds of kale salad! Love your food Deb! I’ve made it with pretzels before -> super good! But ice cream… that’s a new level! Use gluten-free crackers, Caitlin! We have a celiac friend, and bought some so she could enjoy the cheese and salami at a recent party. The crackers are good. Looks amazing, my son’s birthday is coming up and I think this would be a really cool round-the-bonfire pudding/cake. Can anyone help identify what the UK equivalent of Saltines would be? Are they like cream crackers? Thanks! Wow, this is really outside the box thinking! The one good thing about ‘Saltine Crack’ is that I thought it was relegated to the holiday season. Now look at what you have done…made it into a summertime treat! Bravo! These look so amazing!!! Can’t wait to try them. The Mr. LOVES saltines, so this is sure to be a winner! We had so much fun at Greek Festival! Come take a look! Made these immediately after reading. I didn’t have your patience for cutting such neat squares, but they still taste just as awesome in haphazard shapes. Great idea! Oh my goodness! Making this into an ice cream cake for my hubby’s and I’s joint birthday this weekend! Thank you deb! PippaS, saltines are a little different than cream crackers, but they’d be a good substitute since I’ve never been able to find saltines in the UK. You would definitely want to add some sea salt to the toffee/chocolate mixture! I feel so much less alone knowing other people hide baked treats from themselves in the freezer with mixed results. Right now we have homemade brownies in the basement chest freezer. They used to enjoy the company of Tollhouse chocolate chip cookies (Nestle’s recipe but better quality chocolate chips) but –even though I made a double batch–they managed to disappear! Is the chocolate inside-out? — Sorry, it’s taken a few days to respond (not helped by the fact that I’m in Jury Duty right now, bleh)… MAYBE? I considered it both ways, chocolate side down and chocolate side up, and concluded that the nut coating would be a more pleasant exterior than the toffee underside, which might be sticky. But I don’t think either way is terribly neat except when frozen absolutely solid, which it will be as you will inhale these before they get warm. Regardless, I don’t think there’s a right or wrong way. If you try it with the toffee on the outside, let us know how it goes. In the UK — Yes, it looks (from a Google Image Search) that soda crackers are pretty much the same as saltines. Just look for a very neutral white cracker that’s a little salty. Cutting the sheets before freezing — I actually tried this on a batch and it’s definitely one way to approach it. However, if you cut the top and the bottom sheets, it’s hard to get everything 100% perfectly lined up so that the cuts will be in the same place and if you just did the top layer, you’d still be cutting through the bottom, i.e. might as well just cut both at once. But it’s definitely an approach that might make the cutting process neater. Stephanie — SO FUNNY. You’re absolutely right; it was the jar of Saltines I’ve had on the counter since the 1st trimester that got me thinking about more things to do with “crack.” 1st trimester nausea, meet 3rd trimester shameless decadence. Oh, now, here’s my incentive to finally look for a gluten-free equivalent to Saltine’s and to try Rice Dream… These look amazing! So many favorite treats in one lovely dessert. Yum! I didn’t make these … yet … BUT, I have a new ice cream maker and had just made key lime ice cream (cream, egg, sugar, i.e. not a sherbet) and thought…oh, I could use graham crackers and have key lime pie ice cream sandwiches. And I did and they are so good. Thanks for the technique AND the recipe! To the irrational craving (or craving invoked by PMS), I want to add sriracha drizzle on kettle potato chips (or even popcorn if necessary). Salt-y, crisp-y. Finish with dark chocolate, preferably with salt flakes or flecks of chili powder. OMG! Deb, these sandwiches look so delicious! I’m so trying this recipe soon! Outrageous! For instant gratification, I think I might use chocolate digestives and my fave Laloo’s Vanilla ice cream instead. Then perhaps roll in some salted nuts. No thanks for giving me the idea, Deb! Chocolate layer was so thick it was hard to eat them without the ice cream squishing out. You should either be arrested, or awarded the Nobel. Shall report back after our first (twelve) batches. lovely photographs and i am sure the flavour is also delicious.. I HATE to do this to you butttttt the bark (what I call the stuff so deliciously sandwiching the ice cream here) we make at home uses Club crackers and if you ever want to up the sinful level to something otherwordly (or underwordly?) you should definitely give it a go! I made these last night. OMG….so delicious. You were right about cutting them being a bit challenging. Mine look like a mess, but we all just laughed and ate them anyway. So funny, I used to do a STRANGE thing – eat ice cream with saltines! I used them as little scoops, so its great to see this flavor combo in a recipe. Made these last night and tried one this afternoon and it was amazing!! Although I did have some trouble cutting them. Don’t know if it was because I left it in the freezer overnight (well over 8 hours) and then tried to cut them. Any suggestions on the best way to cut them? Ignore that last comment. I forgot that you said to use a serrated knife to cut them! Anyways, thanks for the awesome recipe! Made them as written with chocolate on the outside. Sliced almonds (which I just now, four days later, realized we forgot to toast, to give you an idea of how much we cared when they were in our faces). Sliced almonds limited the messiness, although honestly, I don’t think anyone complained about a little chocolate on their fingers. Serve with napkins and you’re fine. yes! these look incredible. can’t wait to try them! love, love, love your writing. I know I should be coming here for the recipes but it’s about your intros; I could read you for hours. Thank you; you never fail to bring me the biggest smile. You are hilarious. I love reading your blog. I never cook anything (sorry) I just love your sense of humor. I always makes my day. Do you know what temperature you cook your caramel to? I find that my caramel consistency varies by batch when following the “2-3 minute” instructions – after being frozen, some are harder, some are stickier, etc. I think having a target temperature with a candy thermometer would help. Thanks! Also – I can sort of imagine your writerly voice opining on (weird) children’s books – have you ever considered writing about kid lit? I found this hysterical post once, just by accident, and wish that the author would do more! more! more! like this. Maybe I can convince you! These are awesome but my caramel was grainy. Any idea why that happened? Blaire — Hard to say for sure. What kind of brown sugar did you use? 1. I used gluten free “table crackers”, no problem. 2. I wrapped them individually in wax paper right before the party so people could grab them with (relatively) little mess. I wrapped them about halfway (imagine when you eat an ice cream sandwich and you peel the wrapper back) and that worked well. 3. Even pre-cut, they survived my ~1hr. commute in a cooler w/ some ice packs, no problem. I made these with haagen dazs vanilla. I let it freeze overnight before cutting into 2 in squares with a serrated knife. A bit messy but I got mostly very nice squares – a few ugly ones but it was okay. I wrapped each in generous square of parchment paper and took them to a middle school graduation party. They were a hit with kids and parents! They are very rich with the haagen dazs so a 2 in square was more than enough for some people. Thanks for a terrific indulgent recipe! Deb, I used organic light brown. Blaire — Did it seem more coarse than, say, Domino brand? I tried this for a dinner party last night. Everyone loved them. I’d never tried making toffee before so I wrecked the first batch (I let it cook too long and burnt it). The toffee hardens extremely fast so my husband had to help me with my second un-burnt batch (he poured and I spread as fast as possible). They were semi difficult to cut and we found it was actually easier to break them apart with just our hands. Lots of steps but great recipe! Ooh! I can’t wait to try this one. It’s been a while since I’ve made a good dessert. Thanks, Deb! I second basically the whole community here heralding not only your gastronomic endeavors but also your literary genius – ugh Deb, reading your site just makes my day. And it makes me hungry, now I want allll the ice cream crack sandwiches!! I made these over the weekend. Such a fun and delicious dessert. It reminded me of heath bars & ice cream. I used pecans instead of almonds because it’s what I had in the house. Great summer recipe! Mine didn’t even come close to looking as lovely and tidy as yours (HA)–but we ate them so quickly it didn’t matter. Thanks for posting! No, I can’t. I must withstand, hold firm and not cave in …. I MUST HAVE these right now. Gosh, what a heavenly combination and why did I not see the crackers before? I’m going to add to Blaire’s grainy toffee quandary-I also had the same outcome after using a brown sugar I’d never tried, it was definitely much more coarse and almost looked oily in the bag. Crystal something or another, I’ve always used Domino in the past and never had a problem, and am willing to bet that was it. Anna — Might it have been turbinado sugar? I usually buy it from Sugar in the Raw brand but bought some other all-natural brand and it was coarse and seemed oily (it’s not, but it clumped a lot). Anyway, it’s not actually the same thing as traditional brown sugar for baking, which is really just white granulated sugar + molasses, so doesn’t melt the same in recipes. We call the saltine portion of this “Satan’s Saltines”….but the bar has been raised. Blaire- I had the same issue the first time I gave this a try. I had success with turning down the heat to medium-low and letting the butter and brown sugar cook a bit longer. Best. Ice cream sandwich. Ever. My husband opted for these instead of birthday cake and he was not disappointed. The only reason the entire thing has not already been eaten is because I cut just enough for a few individual servings and returned the rest of the uncut block to the freezer. If it was easier to grab and go covertly, no way would there still be leftovers! I’m not a big dessert eater (or maker), but when I saw these, I knew they were on the list for treats on the 4th. They didn’t disappoint! 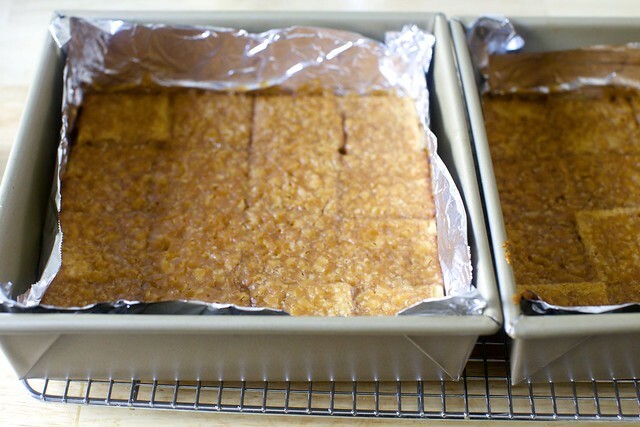 But one major problem I had – totally my bad – is that I started the toffee part before I had the saltines in the pan…went to do it, and then found out I didn’t have any tin foil! My neighbor saved me, but not the toffee part–it separated and so I had to start over with that part. So definitely next time will have the crackers ready to go BEFORE I begin melting the butter and sugar. For cutting, I found that using my big Santoku knife (that I use for veggies) was much better than the serrated one I first used. Thanks for a great recipe, Deb! I made these this past weekend for a 4th of July cookout with friends – They were delicious! Thanks for the inspiration! These are ridiculously good. I made them while on vacation and after the kids went to bed my husband and kept picking away at them. We just couldn’t get enough. I’ve made them a few more times — because, crack — and have two suggestions for anyone serving these to little humans. I would recommend wrapping the cut sandos in waxed paper before serving as the chocolate layer can get pretty messy pretty fast. And, again especially for kids, a thinner layer of ice cream is easier to manage. So, I made your grilled peach splits last weekend (and the weekend before…in which they managed to convince a self-righteous Italian lady that Italy hadn’t *quite* covered the market on all delicious food:). Since I still have a fair bit of caramel sauce left, do you think it would be possible to use that instead of making caramel toffee sauce for these as directed? It seems like it should harden fairly similarly? CK — While it would be delicious OVER these sandwiches as a messy finish, the caramel sauce there with cream is a different sort. It’s thicker and might not bake well onto crackers; the cream keeps it soft. Oh. Dear. God. Just want to eat them now! Been wanting to make these ever since I saw the recipe and have decided tonight is the night! however, i don’t think I have the right sized pans – would it be possible to make one big layer on a jelly roll pan vs two 9×13 pans? Or is that a terrible idea? Can’t wait!! Sarah — Not sure what size your jelly roll is (many are 10×15, which is not double) but a half-sheet pan is indeed double a 9×13 and will be fine. Regardless, this isn’t a recipe where things need to be completely exact. If you have a little more crackers for your caramel or a few less, it will be fine. Made this for a Friday night bbq. Comes together VERY quickly and would be an easy make-ahead item. I wanted a full 9×13 size, so lined two 9×13’s to make two crusts and doubled the amounts of toffee and chocolate to do so. The final product made a nice sized pan for a bbq, but the amount of chocolate on the crust made it nearly impossible to cut or eat. it was VERY hard. A thin chocolate coating is key to success here. I will try making these again, but next time with far less chocolate and a thin layer of ice cream. Also, if you end up with hard thick chocolate that is difficult to cut I recommend scoring it with a serrated blade and then giving it a hearty ‘whack’ downward with a heavy chefs knife. A quick chomp with the chefs knife was the only thing I could do to cut them. Next time i’m considering building these in mini muffin tins or regular muffin size. (think round crackers like ritz) No cutting, benefit of paper liners, etc. In fact, a silicone muffin pan may be the best thing to ever happen to this recipe. They would pop right out after they are frozen! Good point! And perfectly portioned! Amazing! Incredibly delicious. I agree with the comment above about scoring with a serrated knife and then really cutting (or whacking) with the butchers knife. Mine weren’t perfect, but nobody noticed, they were too busy eating them. Made this for a group of friends in a 9×13 pan. Major flavor success – NOT a serving success. The finished product was nearly impossible to cut, and even more difficult to eat. The top/bottom was WAY too hard and very difficult to cut, even with a massive and very sharp chef’s knife wailing on the frozen block. Tried sawing with a serrated knife too… no luck. This was not something you could put in your mouth and take a nice bite of. Again, the top/bottom was way too hard. If you did manage to get it into your mouth and bite down, the ice cream would goosh out the sides because you have to bite so hard. Most people put them on a plate, and dissected it with a fork and knife. Not easy, not kid friendly. I will not be defeated on this concept however. 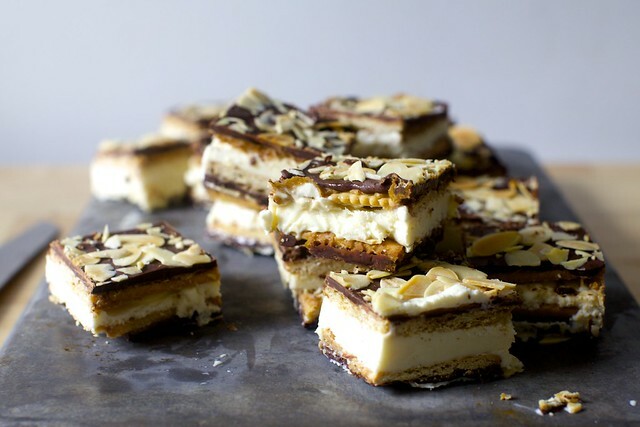 Next time use the icebox cake recipe for a soft cake top/bottom, with the cracker-crack chunks and maybe some chocolate bits incorporated into the ice cream? I rarely use saltines, except in a dish that we only make at the holidays. Thus, I end up stockpiling saltine sleeves with no use for what’s inside. I’ll be making these VERY soon. I baked the toffee for 10 minutes only to keep it supple. It was imperative to use a serrated knife and take time to cut the finished product. It was incredible! Absolutely primo. I made it for date night, and we ate them while watching Doctor Strange. Fun summer evening! My life is complete now. Last year, your chocolate stout cake was the big hit at Fathers Day dinner. This year, it’ll be this!!!! These look so good … though I think I’d be more likely to put the top layer on upside down to cut down on the inevitable melted chocolate on my fingers. (It won’t look as good, but the slightly less-messy version would make me happy. I think each square would require the presence of one fresh raspberry nestled in the middle. Just enough of a tease to say, what was that?! I had one of these for breakfast this morning. Not sorry. Also, I was apprehensive due to the comments about pesky cutting, but I had absolutely zero issues using a serrated knife. These are so easy, it’s going to be a dangerous summer. I just made this and there was not enough of the toffee by half. I made a second batch to cover the crackers entirely and I’m still not sure it was enough. They are however lovely and I am sure they will taste good. My grandmother, Letha, made a strawberry shortcake with saltines. We call it “Okie shortcake”. Guess where my people are from? Like this recipe, put the saltines on the bottom of the pan. Crush the strawberries with as much sugar as you like for sweetness, spoon a layer of strawberries over the the saltines. Continue layering saltines and strawberries, finishing with a saltine layer. Put this in the fridge for about 1 to 2 hours. Serve with whipped cream. I use a glass pyrex cake pan, 9 x 9 inch.